by Rieke Heitmüller. On the 7th and the 13th of August in the afternoon, six girls from my Life Player project, my colleague Antje and I headed off towards the Rhodes University Journalism Department. 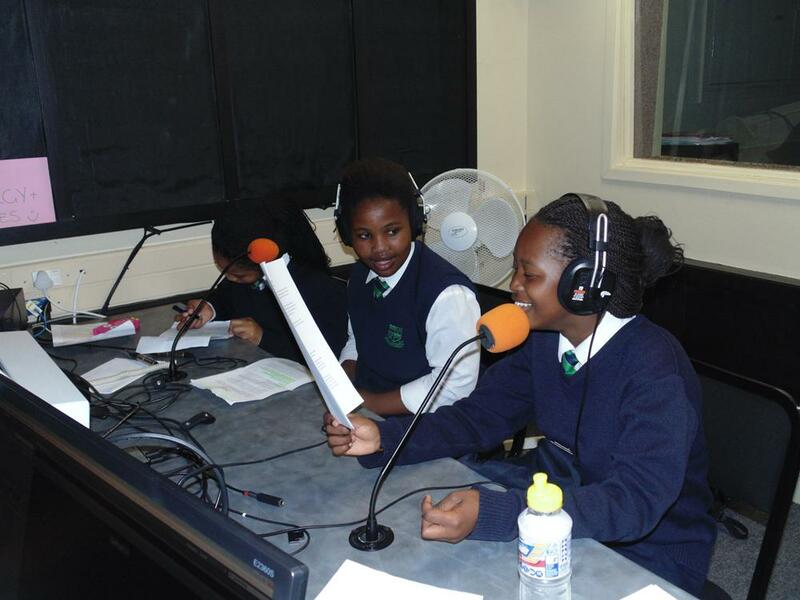 After a few months of practicing to read stories in an exciting way and taking part in drama sessions, we finally reached our goal and recorded five stories at the Rhodes recording studio. We were assisted by the third year radio student, Candice Therese le Kay in recording the German fairytale “Little Red Riding Hood” and fourAesop fables. The girls were very excited and nervous at the same time about the recordings. We also had to be spontaneous and switch the roles of some stories, because not all of the girls could take part in the recordings. For that reason, I’m very proud of the girls for their patience, commitment and improvement in reading the stories. The new Life Player stories are available to other learners on awarenet and reading sessions from learners to learners are planned soon! This entry was posted in Life Player, story telling. Bookmark the permalink.